Dogs in research performed by the University of Florida, NESDCA-certified canines tested averaged a 98% accuracy rate in detecting the odour of live bed bugs and viable eggs in a controlled hotel room experiment. Our canine teams can accurately search an average-sized hotel room in just two to three minutes. Since there is no need to dismantle (or reassemble!) furniture for a canine inspection, the savings in manpower hours alone is staggering. A man needs at least 30 minutes to do the same job, and with nowhere near the same reliability. Our dogs can be utilised as a tool to monitor treatment effectiveness. And because our dogs are trained to detect only the odour of live bed bugs and viable eggs, the remains of a previous infestation will not cause them to falsely alert. 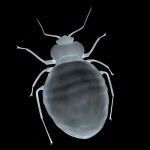 Conversely, without actually seeing live bed bugs it is virtually impossible for a human to know for sure whether or not any telltale signs indicate an active infestation. Humans Human visual inspections are estimated to be only 17 to 30% accurate at early stages of infestation. Whilst fully grown bed bugs are visible to the human eye – adults are about the size of an apple pip – they are masters of concealment, sometimes hiding in inaccessible areas such as walls and floorboards, leaving even the most experienced pest controllers unable to locate them. But while the bugs themselves are difficult enough to spot, their eggs are virtually impossible, being about the size of a pin head.